CELEBRATE THE DEPTFORD ANCHOR AND DEPTFORD'S MARITIME HERITAGE! The Deptford Is Forever logo (above) adorns our T-shirts. The more intricate design Give Us Back Our Bloomin' Anchor (left, click to enlarge) is emblazoned on our cotton shoppers. Prints of the larger design are also available. 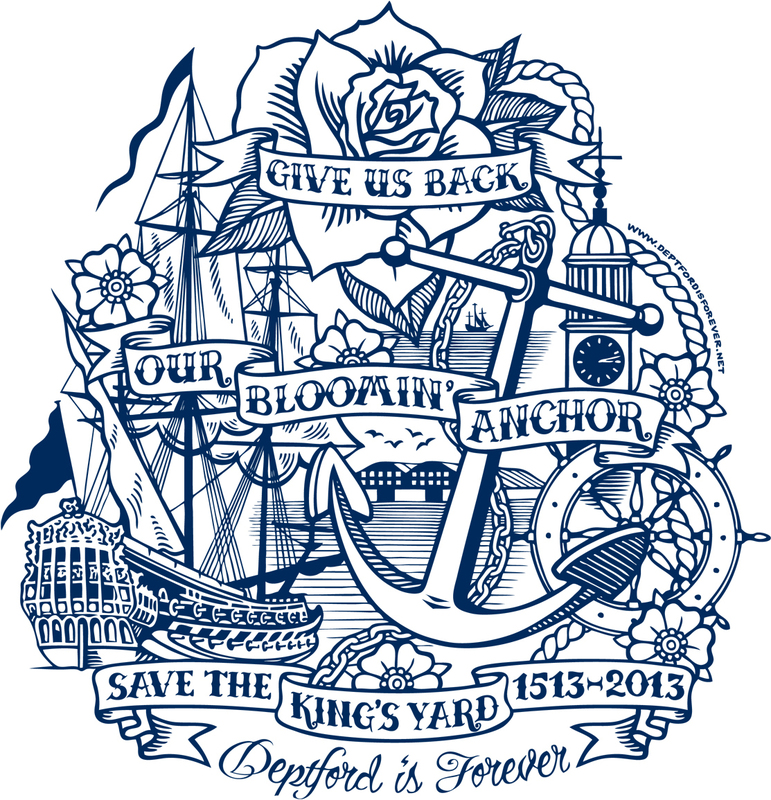 Deptford Is Forever have adopted, adapted and appropriated the language of the sailor’s tattoo to urge the citizens of Deptford to demand the return to the high street of the Deptford Anchor, a potent symbol of our maritime heritage. The drinkers did not disappear though. They continue to congregate in front of the betting shops, and new characters hang out in the newly paved Giffin Square in front of the newly built Deptford Lounge. Already, the posh new paving is stained with the detritus of the weekly market. It is never cleaned properly and is patched with tarmac where utility companies have dug up the paving and not replaced it. The promised new focal point, a coffee shack, for the 'top' of the high street where the anchor once stood, has never appeared. Seating planned for the newly paved area was also abandoned, lest the drinkers return. The King's Yard stolen by 20th century privateers! The Deptford Anchor arrived at the top of the high street in 1988, a gift from Chatham Dockyard, and was removed in 2013 by Lewisham Council as part of 'improvements' funded by the Mayor of London's Outer London Fund. Although it had become a much loved landmark, pressure to remove the anchor came from owners of retail properties further up the street who rarely visit the area let alone live in it. They were keen to see the street drinkers who hung out around the anchor removed. They wanted a 'clean' street to match their expectations of increased property values (and rents) that they hoped would accompany the opening of the newly renovated station, the advent of a newly paved market area and RISE aka The Deptford Project luxury apartments next to the station. Rather than simply remove the plinth the drinkers sat on, the entire thing was 'disappeared'. The anchor is now being stored out of sight in the Olympia Warehouse, the Grade II listed 1840s ship-building shed that is the only above ground structure still standing at Convoys Wharf, formerly the historic King's Yard founded in 1513 by Henry VIII. The present owners, Hutchison Whampoa, are 'looking after' the anchor for us! How on earth did that happen? The anchor was our only remaining symbolic connection with Deptford's maritime greatness in the public realm. There exist many historical artefacts found in Deptford, but they are all locked away in a National Maritime Museum warehouse, rarely to be seen. Greenwich is seen as the home of British maritime history and empire, yet none of that would be possible without the King's Yard and the private shipyards of the East India Company that surrounded it. Even Lewisham has for far too long neglected the part Deptford has played in history. "...history promotes local identity, respect and 'the confidence to take part' in the charges which take us into the future. Lewisham does not even have a museum...Councillors and developers argue that promoting historical awareness does not 'regenerate' Deptford and is therefore not worth funding. If our history had not been treated with such indifference and ignorance we would have less need of full-scale regeneration. As it is, only through learning the lessons of the past and making it come alive for us in the present can we take Deptford proudly into the next century. We have to turn this tide of neglect." Deptford boasts two very famous diarists connected with the King's Yard : Samuel Pepys and John Evelyn. Pepys was Chief Secretary to the Admiralty, and Evelyn lived at Sayes Court where he created a garden and wrote treatises on clean air and horticulture. His work became the inspiration for the formation of the National Trust, and the remains of his manor house can be found within the Convoys Wharf site. Two local community heritage projects have worked hard to be included in Hutchison Whampoa's plans. Sayes Court Garden CIC want to promote Evelyn's legacy as the father of modern sustainability and create 'A New Homes for Horticulture and Landscape'. The Lenox Project CIC wants to create a replica of a 17th century ship originally built in the Kings Yard as part of the shipbuilding programme initiated by Charles II and overseen by Samuel Pepys. They also want to sail the ship, build more ships and establish a Deptford Museum. Both projects offer great opportunities for education, local employment and tourism. With backing from Lewisham Council and Deptford's MP Joan Ruddock, both projects convinced Boris Johnson to include them in the development. The remains of Evelyn's manor house will now be preserved in one of the massive blocks, and a new school has been moved to allow a garden to be created where Evelyn's once existed, but the Sayes Court Garden project's plans for a stand-alone building have been thwarted. The Lenox Project has yet to find a permanent home on the site, and their preferred location, the Double Dry Dock next to the Master Shipwright's House where the Lenox was originally built, has been stonewalled by the developer. There are still no favourable terms forthcoming from the developer that would allow either project to fulfill their visions in their entirety. Conditions written into the Section 106 agreement are biased towards the developer. In the case of the Lenox Project they will be prevented from ever getting started, let alone succeeding. In Spring 2013, Hutchison Whampoa, the mighty Hong Kong based conglomerate owned by the richest man in Asian, Li Ka Shing, submitted plans to Lewisham Council for the redevelopment of Convoys Wharf. In October 2013, the Mayor of London 'called in' the application at the request of the developer, and the GLA became the Planning Authority in charge of the former King's Yard. On 30th March 2014, Boris Johnson granted planning permission for Hutchison Whampoa to build 3500 luxury homes on the site. With only 14% 'affordable' housing, poor public transport links, and parking for 1800 cars for which there is no road capacity, this has to be one of the worst riverside developments in London. A monstrous ghetto for the rich to be marketed to overseas investors, it will include three towers, the tallest of which is 48 storeys. Most of the archaeology of the site will be buried under massive blocks. The Olympia Warehouse will be saved only because it is listed, and will probably end up as a shopping centre. Its refurbishment is part of the second phase of the development starting in 8-10 years' time. After the first phase is built, the Deptford Anchor may reappear as an embellishment to the riverfront. The GLA took over because the developer accused Lewisham Council for taking too much time. At the time of writing, eight months after Boris gave the developer the go-ahead, the Section 106 agreement has still not been signed. The S106 determines the developer's responsibilities to mitigate the impact of their development on the area, but Hutchison Whampoa will not agree the terms of the financial 'Review Mechanism' that would allow more affordable housing to be built at a later stage. Hutchison Whampoa's architects are Terry Farrell Associates. Sir Terry is one of the Mayor's closest advisors. He also wrote the Farrell Review into architecture and the built environment for the government, published in the same month that Farrell's designs for Hutchison Whampoa got the go-head from Boris Johnson. Farrell talks about 'a new understanding of PLACE' and better consultation with communities to develop local masterplans...whilst taking part in one of the most undemocratic processes in London planning history. "The value of our cultural heritage for tourism, one of the fastest growing sectors, cannot be underestimated.. Government and instititutions should maximise the significant economic benefits of our heritage by opening up even more of our heritage assets to the public and preparing for massively increased tourism from the world's emerging economic powers."